The most magnetic massive star seen yet is dragging a giant cloak of trapped charged particles around it. This newly discovered star, NGC 1624-2, could help shed light on what role the magnetism of stars plays in the evolution of stars and their galaxies. NGC 1624-2, which lies about 20,000 light-years from Earth in the constellation Perseus, has about 35 times the sun's mass. Its hefty mass gives it plenty of fuel, making it bright and hot and thus likely to burn out relatively quickly after a lifetime of about 5 million years, or one-tenth of 1 percent of the sun's current age at midlife. This massive star possesses a magnetic field 20,000 times stronger than the sun's and nearly 10 times stronger than that detected around any other high-mass star. This powerful magnetic field binds and controls the stellar wind of energetic particles streaming from NGC 1624-2 "to a very large distance from the star — 11.4 times the star's radius," Wade said. "The huge volume of this magnetosphere is remarkable. It's more than four times wider than that of any other comparable massive star, and in terms of volume it is around 80 times larger." In addition, as powerful as NGC 1624-2's magnetic field is, it might pale in comparison with that of magnetars – dense remnants of dead stars that are often thought of as the universe's most magnetic objects. "The magnetic field of NGC 1624-2 is about 20,000 gauss at the star's surface. 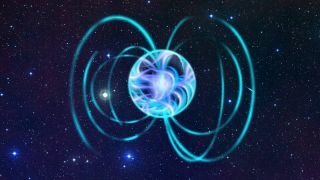 A typical magnetar might have a field on the order of 10 trillion gauss, so the strength of the magnetar's field is much larger — that is, 500 million times larger," Wade said. However, "the standard basis for comparison of how 'much' magnetic field is present is the magnetic flux, which is equal to the strength of the magnetic field times the surface area of the star," Wade said. "In that case, the flux of NGC 1624-2 is almost 700 times larger than that of a typical magnetar. "In other words, if NGC 1624-2 were to suddenly collapse to the size of a magnetar while retaining all of its magnetism, it would have a surface magnetic field of nearly 10,000 trillion gauss. Holy cow!" The star's magnetic field influences the internal structure of matter within NGC 1624-2, affecting its life from birth to a violent death as a supernova explosion, Wade said. However, the fundamental processes that produce the magnetic fields of massive stars remain poorly understood. The star is both distant and surrounded by dust. To study its light in detail, the international team of scientists monitored this star with the immense light-gathering power of the mirror at the Hobby-Eberly Telescope at the University of Texas at Austin's McDonald Observatory. Their observations suggested the star is rotating quite slowly, taking about 160 Earth days to spin once on its axis. In comparison, it takes the sun about 25 days. The team also measured the strength of star's magnetic field using the Canada-France-Hawaii Telescope on Hawaii's Mauna Kea. Specifically, they looked at small variations in the direction of rotation of the electromagnetic waves absorbed or emitted by atoms located in the magnetic field. Understanding more about massive stars would yield insights on their galaxies as a whole. The powerful magnetic field of NGC 1624-2 and its effects on its stellar wind "may well have influenced the star's effect on the surrounding cluster and nebula," Wade said. "Magnetism, an essentially invisible phenomenon even to most astronomers, can have extraordinary impact." "The most important question we seek to answer is: What is the origin of magnetism in massive stars — where do the fields come from?" Wade said. "We believe this must happen when the stars are very young. It has recently been suggested that stellar collisions and mergers during star formation may be responsible. A major next step is to investigate these early stages of evolution, and in particular to examine the magnetic properties of binary star systems, since these may represent examples of systems that suffered encounters early in their history." The scientists detailed their findings in the Sept. 11 issue of the journal Monthly Notices of the Royal Astronomical Society.